Football Season - a time for excitement, disappointment, camaraderie and a lot of yelling. Unfortunately, it is also a time for very unhealthy foods! Since my Crohn's doesn't usually let me indulge in anything cheesy, fried or creamy, I usually always volunteer to bring something myself. 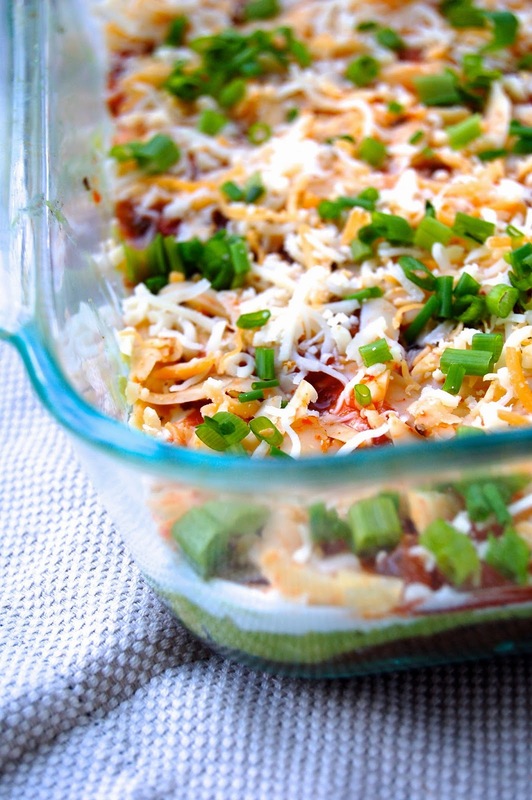 And one of my favorite crowd pleasers, that happens to also be a waistline pleaser, is my 7-Layer Bean Dip. All you need to do is dedicate a little bit of time and make a few substitutions, and you can make your own easy layer dip that doesn't include all of the calories. I thought this would be a perfect addition to the Live Draft Party for my all-girls-fantasy football league. Why should the guys have all the fun??? All the gals brought something over to our friends house, where we setup our computers for draft time. There was a lot of yelling, cursing, a few drinks here and there, and some very good food. Katie decided to make these yummy bits (Oreo Cheesecake Pretzel bites....remember the Chocolate Peanut Butter ones)?? And the table was filled with delicious food from everyone's kitchens. We put on our jersey's (paused for a very girly picture) and got down to business with the draft. The great thing about this dip, is that you can make several layers ahead of time and assemble right before the party or get together. The best way to keep this healthy is to make your own bean layer instead of the mystery refried beans that come from a can. Start with the bean layer. In a large saute pan over medium heat, warm the oil and saute the chopped onion for about 5 minutes. Stir in the cumin, chili powder and pinch of salt until well combined. Add the black beans and stir to warm up. Stir in the vegetable broth and bring to a simmer. With a potato masher or back of a large spoon, start to mash the beans in the pan. Continue to cook on medium-low heat, stirring and mashing along the way, until the mixture has thickened. Another method to "mashing" the beans is to place them into a food processor. Set the beans aside to cool. Make the guacamole to your preference. We like to simply mash the avocado and mix in a little of our favorite salsa. Set this aside. Once the bean layer has cooled, get ready to assemble the dip. Spread the bean mixture in the bottom of an 8x8 glass dish (or dish being used for the dip). Then spread the guacamole on top of the beans, being careful not to blend them. Next, spread a layer of sour cream, then salsa and shredded cheddar cheese. Place this in the refrigerator until ready to use. Layer the shredded lettuce and chopped tomatoes on top of the dip right before serving. Garnish with chopped fresh chives. 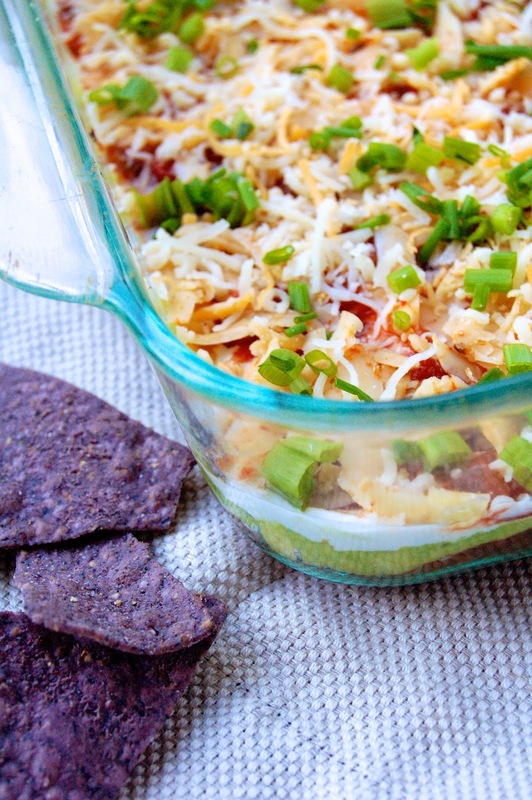 Serve with your favorite tortilla chips and enjoy! !